Left wing Dustin Penner, who signed as an unrestricted free agent with the Anaheim Ducks on July 16, 2013, was always good for a good quip or a joke while talking with the media during his time with the Los Angeles Kings. LOS ANGELES — In case you missed it, now former Los Angeles Kings left wing Dustin Penner, who became an unrestricted free agent on July 1, signed a one-year contract valued at $2 million with the Anaheim Ducks on July 16, returning to the team he began his National Hockey League career with, not to mention the team he won his first Stanley Cup with in 2007. Penner joined the Kings when he was acquired in a trade with the Edmonton Oilers on February 28, 2011, in exchange for defenseman prospect Colten Teubert, a first round selection in the 2011 NHL Entry Draft, and a conditional third round pick in the 2012 NHL Entry Draft. During his tenure with the Kings, Penner quickly become known for his sense of humor, and quite often, he had a good quip or humorous comment for the media. Penner’s tenure with the Kings got off to a rather poor start, scoring just two goals and adding four assists for six points in 19 regular season games. He also scored a goal and added an assist for two points in six playoff games. Penner made that drive three days each week. Just prior to the start of the 2011-12 season, the Kings held their annual Hockeyfest at Staples Center on September 13, 2011. Penner was, once again, in rare form, when he was asked about his conditioning after spending much of the summer in the weight room. 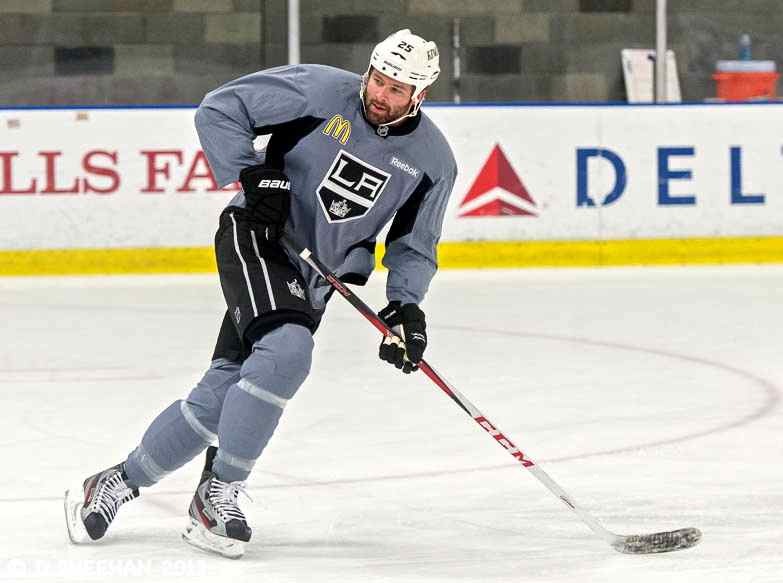 Penner, who owns a home in Newport Beach, California, was making the more than forty-mile trip (each way) to the Toyota Sports Center in El Segundo, the Kings’ practice facility, for his workouts. That summer, he moved to Hermosa Beach, which is just a hop, skip and a jump away. “It’s very stressful, driving the carpool lane without someone in the passenger seat,” Penner joked about the long commute from Newport Beach. Playing along with the joke, Los Angeles Times sports columnist Helene Elliott asked if he had been caught by the California Highway Patrol for driving in a carpool lane illegally. Days later, when the Kings opened their 2011-12 training camp, Penner was asked about his weight. Penner was asked about his weight because it was evident that his strength and conditioning work had paid off. He was also noticeably faster and quicker during pre-season games than at any point during the previous season…maybe even in his NHL career. Penner talked about a faster cruising speed, and being able to create separation. Then, he talked about the advantage of having greater speed. That was a new one, that’s for sure. Early in the 2011-12 season, Penner suffered through various lower body injuries that kept him out of the lineup in the first handful of games. With the injuries behind him, Penner played a regular shift during a 5-0 victory over the St. Louis Blues at Staples Center on October 19, 2011, contributing an assist. “I skated well, I thought, pretty pain-free,” he said. But then, as it often does, the Dustin Penner Comedy Hour kicked in. “It took four Aleve, two Celebrex, and two other, unspecified drugs,” he quipped. Fast forward to the 2012-13 NHL Lockout, Penner talked about his decision not to play hockey in Europe while waiting for the NHL to get back onto the ice. Back to his conditioning…prior to the start of the abbreviated 2013 NHL season, Penner was asked about his conditioning coming off a very uncertain 2012 off-season. Once the 2013 NHL season began, Penner found himself out of the lineup quite a bit, and on January 30, 2013, he talked about his situation. Penner also indicated that he and Sutter have spoken frequently about his situation, and what he needs to do to change it in a positive manner. So the great white dope never thought of asking to spend the night or two at a team mates house in Manhattan/Hermosa Beach? Idiot. He actually rented a place in Hermosa Beach instead, as I reported. Smarter than you thought, apparently.